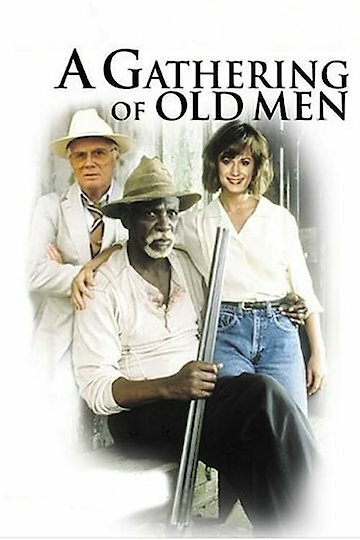 A Gathering of Old Men is a film based on a novel by Ernest J. Gaines. The movie describes racial tensions in the South, and takes a look at those people brave enough to fight for the rights of others. The story begins when an older black man named Mathu, played by Louis Gossett Jr., is attacked by a white racist named Beau Boutan. Boutan has long been known as a dangerous man, but when he confronts Mathu, he takes things too far. In order to protect himself, Mathu shoots and kills him. Candy, played by Holly Hunter, is a young plantation owner. She owns Mathu’s land, as well as the land of many other African Americans. Unlike many of her white neighbors, Candy supports the rights of the African Americans, realizing that they are people just like her. When she finds out that Mathu has killed Boutan, she knows that Mathu is in serious trouble. She quickly decides to do everything she can to protect him. Candy gathers together seventeen other black men. She and each of the men bring a shotgun with one empty shell, and get together in Mathu’s yard. When the sheriff arrives to question Mathu, Candy and the other men all claim to have been the one to shoot Boutan. The sheriff knows that not all of these people could have shot Boutan. However, with everyone claiming to have done the deed, the sheriff has no idea what to think. He can’t arrest everyone. Candy and the other men hope that, by muddying the case and the suspect pool, the police will not be able to pin the crime on Mathu. However, even as their plan seems to be working, members of Boutan’s family arrive. They are demanding justice for Boutan, and will do nearly anything to get it. A Gathering of Old Men is currently available to watch and stream, buy on demand at Amazon online.